Four designs contested the 2018 Medal and the £5000 prize fund. The winner, Red House, was presented with the Medal at the Sunday Times British Homes Awards in London on September 20th. The prestigious Manser Medal for the best one-off house went to a speculative house by a developer, not a homeowner’s grand design. Red House, a red-brick terrace in south London, “shows that by using the best architects, developers can create great architecture and very sellable houses out of even the most challenging sites”, says the architect Jonathan Manser, who led the judging for this award. The Medal was conceived in 2001 to inspire innovation in house design, to show how social and technological aspirations can be met by intelligent design. The Medal winning designs over the years presented within the archive are exemplars to inspire the wider house-building industry. 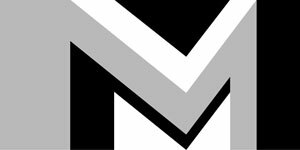 “To sustain the Manser Medal’s reputation and to retain the interest of architects, the public and the press, the Medal needs something to distinguish it from the many other housing awards. The buildings we consider are a cut above the rest, in that each has won a design award for housing. But the Manser judges are looking for extra qualities that match the architects’ intellectual aspirations. Historically, architecture has always responded to society’s needs, coming up with new methods and materials that exploit the latest technical developments, all within the compass of reasonable expenditure. The judges are looking for an inspirational step forward, perhaps an experimental approach, certainly an unequivocal 21st-century solution for 21st-century occupants. This is a house that can’t be ignored, has many stunning and surprising elements and whilst unlikely to be copied will give Architects and house builders much to think about. A fantastically brave and well executed ‘grand project’ of domestic architecture! 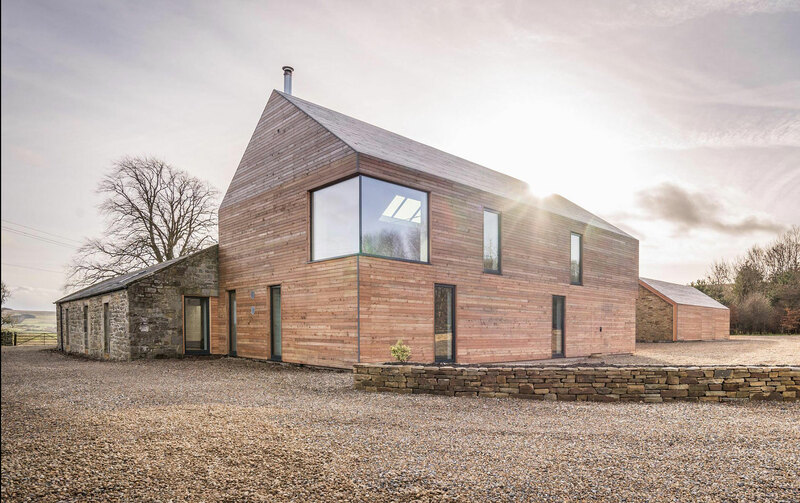 Located in an exposed Northumberland setting – Shawm House is an exemplar in residential design, innovation and construction and the product of five years of collaboration between Dan Kerr of MawsonKerr Architects and the client’s son, Richard Pender. The house consists of a two storey timber frame new build which links to a small single storey existing stone stable block. These elements along with the new timber framed outbuilding are ‘anchored’ to the existing stone wall which acts as a shield to the prevailing South Westerly winds and an axis between the new builds. 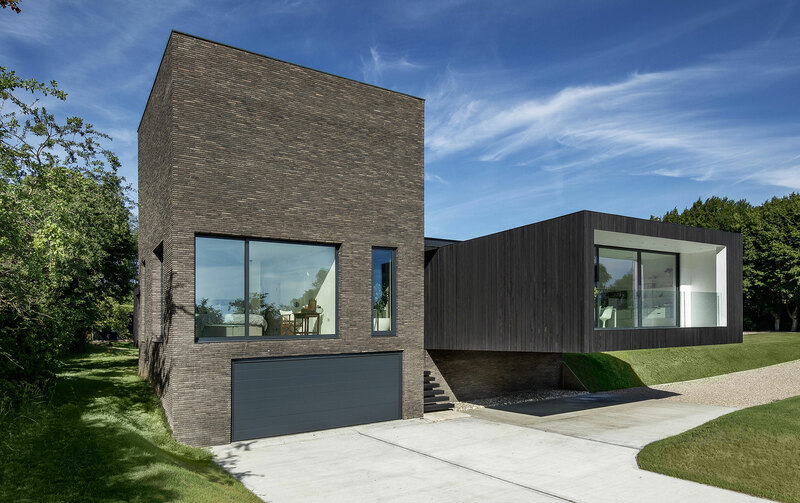 The house is wrapped in a thick larch ‘blanket’ that seamlessly envelopes the roof and walls, below which is a highly insulated and airtight building. Shawm House shows that a house with a conservative budget of £350,000 build cost (less than £1500 per m2) can be high quality in design and architectural rigour. The client brief to AR Design Studio was to construct a new detached house of contemporary design, using sustainable construction methods and materials. The floating form and massing of Black House was inspired by Sissinghurst Castle Garden, where the gardens are broken into a series of individual experiences hidden from each other by manicured hedges and weathered red brick walls. Clad in vertical black timber throughout, the Black House’s rectangular massing is divided into blocks, with each block linked to a distinct aspect of the garden, with a final connecting view provided from the roof of a brick tower. The volumes are separated to create a central courtyard, with a cantilevering roof to tie the modules together and the building is raised and overhangs a plinth base, giving the appearance of a lightweight series of units floating gently above the landscape. Hackney Backhouse is a brave, imaginative and contemporary two-storey, three-bedroom family home which has a gross internal area of 112 sqm neatly tucked onto an 11m by 8m site in a Hackney Conservation Area, formerly occupied by a run-down garage and workshop. Keen to avoid divorcing the house from its context and its neighbourhood, Guttfield Architecture designed a house with a direct visual relationship with the street – the house is part of the street and the street part of the house. 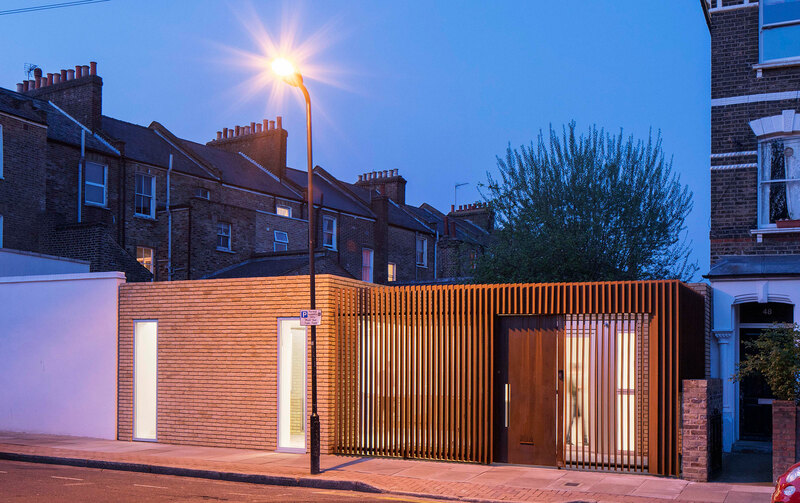 A screen of vertical corten louvres between the house and the street is intended as a simple device to moderate this two-way relationship. Inside, the large areas of glazing make the lightwells feel part of the ground floor layout and help the plan feel more open and spacious. The basement level, which houses three bedrooms and two bathrooms, is arranged around two secluded external courtyards which allow ample daylight into the spaces.